One of the fun things that local CAMRA branches do is to organise monthly pub-crawls, and my branch is no exception. Not only are they good social occasions, but they are a chance to visit areas and pubs that I don't often drink in – they also help the branch keep in touch with what's going on in that area. Last night it was East Twickenham, an area which seems to have smartened up in recent years, yet where the trade has seen a bit of turmoil with pubs either lost to property developers or under threat – the two can be related of course. I missed the first pub on the list, the Aleksander freehouse (formerly a Young's pub called the Marble Hill), which was unfortunate as I'm told it was offering Oakham Citra and two Thornbridge ales. Fortunately when I caught up with the other eight or so chaps in the Crown it was pretty much the highlight of the evening. 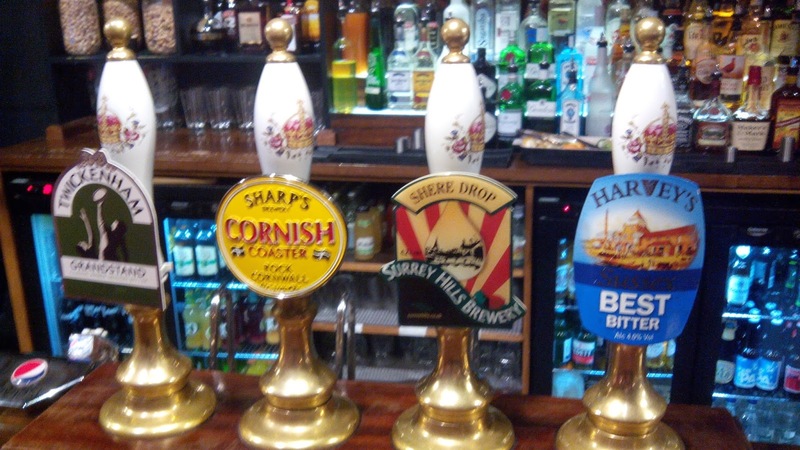 Four ales on, all in excellent condition. A few years ago this was a pretty scruffy pub, but after it was refurbished and reopened last year it's now a delight – comfy, attractive, friendly service, and reputedly the food is good too. Two clips for the same beer! From there it was a stiff trot to the Old Anchor. I don't think I'd been in here since it was a Youngs pub – it's been a freehouse for a couple of years now I think. 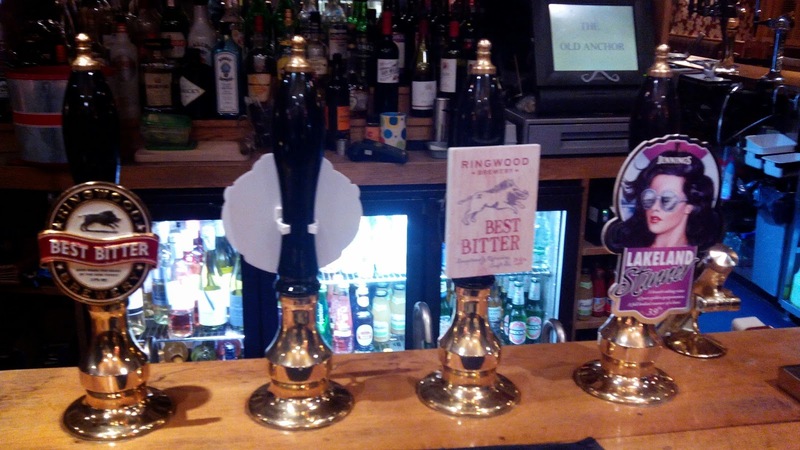 It's also been under threat for longer than that, and now the end is near – for its current incarnation at least, which is probably why only two of its seven handpumps were in use, offering Ringwood Best and Jennings Lakeland Stunner. Barry the publican told us he's leaving at the end of April, and that plans have been submitted to turn almost the entire building into flats and also to build over the garden. The building's frontage is locally-listed however, so the developers say they will keep a tiny bar open there. I don't understand how they will get these plans through when they include no provision for parking, which is already in short supply. Then it was a stroll down to the Thames and the riverside White Swan. Another freehouse, the pub is raised up from the street and it looked like yesterday had been one of the days when the high tide floods both the road outside and the beer garden. Was this also why it reeked of fish, or was that left over from lunch? 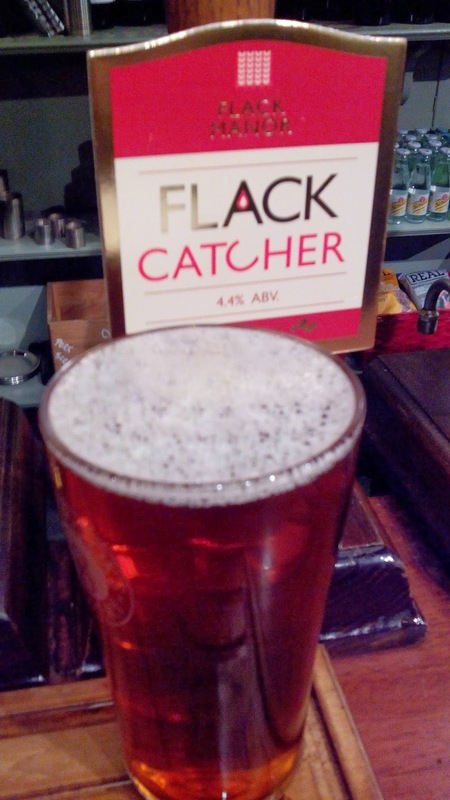 Either way, I think there were five ales on, all reportedly in fine condition, including my choice of Flack Catcher, a tasty bitter from a brewery I'd not heard of before, Flack Manor. That was supposed to be the end of the crawl, but a few of us had been discussing the other changes in the area's pubs, in particular from the cr*ft beer perspective, so we decided to pay a quick visit to the relatively new Ales & Tails cocktail bar and 'craft beer house'. Although they advertise having eight cask ales, only two pump-clips were visible, one each from the Brighton and Hastings breweries, and both sadly tasted slightly sour. Fortunately, they had had just put on a third ale, Clarence & Fredericks' American Pale Ale, and that was excellent – but then I've not had a bad beer yet from this new Croydon-based brewery. Drink London at London Drinker!